P E O P L E P O I N T S: Dear UNESCO New Zealand - pick OLPC! Dear UNESCO New Zealand - pick OLPC! Heard this story today, that those very nice UNESCO people here in New Zealand recently had a spare $500 and were asking around for suitable places to spend it. Although the moment is long gone, my immediate reaction was why not buy a One Laptop per Child 'laptop' and then leave it in Bellamy's, the restaurant inside the NZ Parliament. Then see which of our Members of Parliament has the curiosity to pick it up, and ask what's this? And then afterwords, think to ring Anne Tolley, the NZ Minister of Education, and ask if she was talking to OLPC? The Vision Thing from Australia! In advance of the question, and to inform the subsequent phone call, go and and see what is happening in the rest of the Pacific, here - or as it is now fashionable - go and have a look at what Australia is doing right now- here? Or if you have three minutes - watch this. 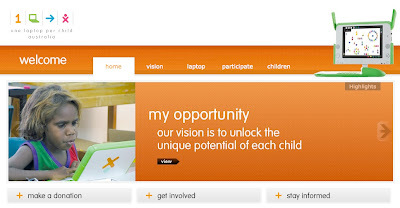 I think the design - architecture and messaging on the OLPC site Australia is a total stunner. End of!